1966 is a time that is very much of an impression rather than a memory. I was only 18 months old when the first episode ran and barely three years old when the series ended its first run before syndication a few years later. But my earliest memory as a child of that age WAS of Batman and Robin, standing in Commissioner Gordon’s office. Since I didn’t understand what they were saying, I had gotten the impression from Gordon’s serious and urgent tone of his voice that he was upset at the dynamic duo. It’s amazing what you pick up on as a child. Even more amazing what sticks with you. Before I ever knew that there were such things as comics, there was Batman as played by Adam West. That’s the way he was supposed to look, act and BE. For me. During my childhood years growing up in Bradenton Florida, comics and superheroes grew to become an important component of my life and mental make up. Doing the right thing. Good and bad. It was pretty clear cut what seemed to be right and wrong and who the heroes and villains were in the comics of those days. I think I learned more about basic moral values in those pages and the TV show than I ever got out of Sunday school as a kid. I learned politeness and good manners from Alfred. I gravitated towards drawing comic characters and developed some skill in those early days. I always wanted to draw Batman as he looked on the show. As I got a bit older and the show ran periodically in syndication, I started to study it. I would look at the cowl’s ears and the utility belt compartments. I would count the cylinders on Robin’s belt when he stood still long enough. Oh, to have had a VCR back then. To this day, if I draw a Batman, it’s an Adam West Batman. Right down to the nose lines painted on his cowl. As many of us have done, I became interested in other things while growing into adulthood. I got involved in music and had dreams of being a rock star. During those years, Batman evolved and I evolved. Batman changed with the times and I changed too. 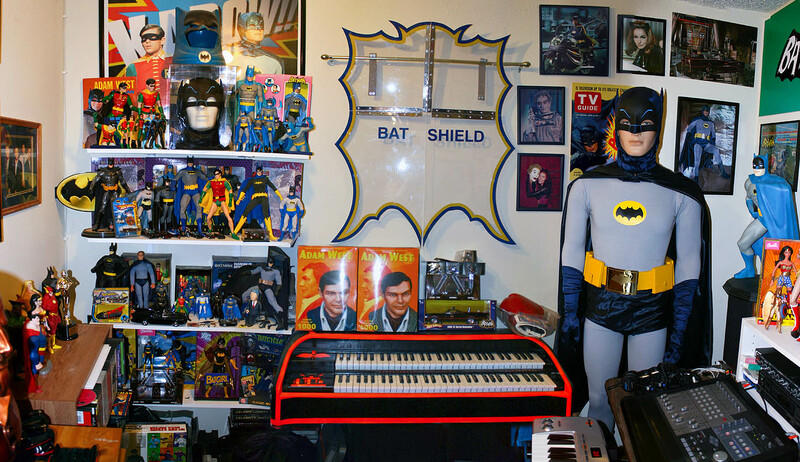 Batman was much darker and so was I.
I remember standing in line to see the 1989 “BATMAN” film with my lead vocalist, Steven Mercado, who was sporting a push pin badge with a picture of Adam West on it. 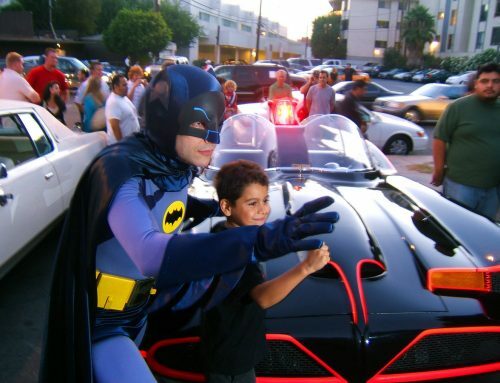 I looked at that little picture of Adam fondly while thinking, “Wow, Batman was so cool back then.” I then saw the big movie and left with the feeling that something was missing in that production. I wanted to like the movie, but there was a void that I didn’t have the words for…yet. By the time the second film came out, the band had broken up, I married Vickie and was working at a recording studio as an engineer. I had gotten myself a Michael Keaton style Batsuit together for Halloween. It was a kick to put on the cowl, gloves and cape. I could do a pretty good Keaton, “I’m Batman” voice. But in the back of my mind, I was still wondering how did they ever make that cowl that Adam wore? Over the next ten years, I changed professions, celebrated anniversaries with Vickie and eventually bought a house. 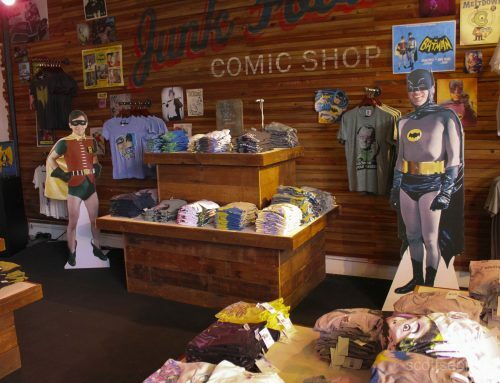 Vickie had a sizeable comic book collection when I met her, but it was a good thing that we got the additional room when we did, because those collections don’t get smaller. I felt that it was strange that I wasn’t buying any Batman titles when we would pick up our weekly run of comics. At one point , somebody asked me who my favorite character was and without missing a beat I said, “Batman.” So why wasn’t I buying any of the recent issues or rushing out to see the last two films when they came out? Something was wrong in the equation. In our new house, I had a room of my own to use as a studio for my recording or a place to do my drawing or computer graphics. Over a short period of time, I started to fill the room with action figures, framed pictures of past icons from my childhood and autographed albums. I wanted to put up a picture of Adam and Burt with the rest of my collection but found it incredibly difficult to find anything. I then noticed that it was difficult in general to dig up anything from the classic show. 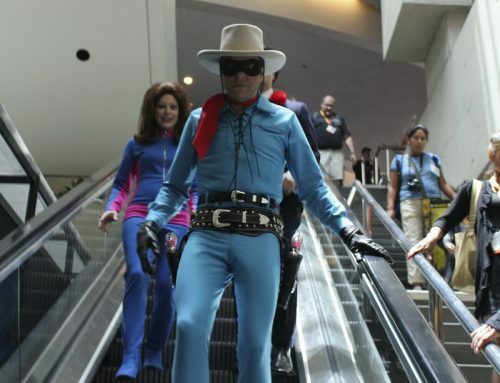 In 2001, I attended the annual San Diego Comic Convention. While Vickie was filling gaps in her comic collection, I was hunting down a Corgi Batmobile for my studio. I couldn’t find a single Corgi but I did stumble upon one Batmobile. It was a George Barris original. 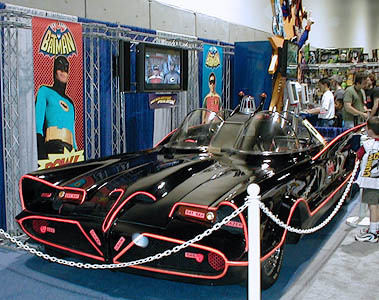 They were promoting the upcoming DVD release of the 1966 “Batman Movie.” I couldn’t take my eyes off of the car. I couldn’t take my eyes off the TV playing the DVD. Something was connecting with me. By this point now, I recognized that connection anytime I saw something from the original series. 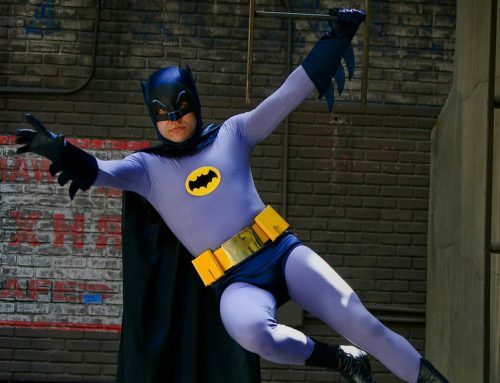 To give that connection words to the best of my ability, I can only say that the TV show was, is and will always probably be the defining version of Batman for me. This is not to put down the other versions and incarnations of the character, but they fall short of that inherent bond that the show always seemed to have with me. But now my story has only begun. I have found fun, fulfillment, new friends and peace of mind since I have started. These entries will account some of those chapters in my journey as well include new ones as they occur. It has been a fun ride so far and there is plenty of room in the Batmobile to join me, so…Batteries to power. Turbines to speed.